I can't believe how long it's been since I've shared a recipe with you!! It's not like I haven't been cooking, I certainly have....some amazing meals have come out of this little kitchen this winter! 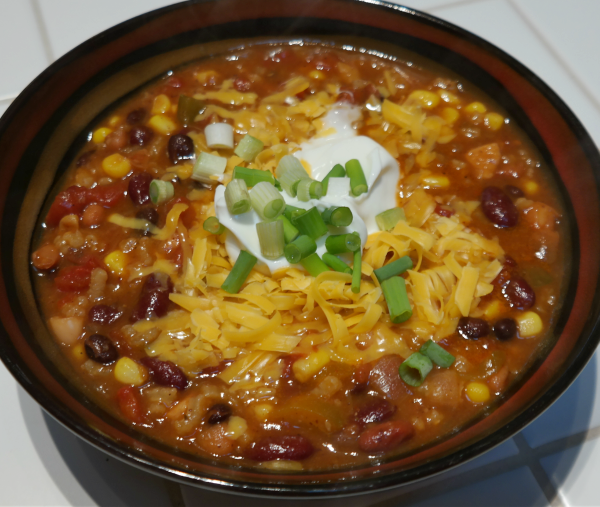 Well, fortunately I decided to take photos the other night when I made this amazing Chicken Taco Soup because it is most definitely a KEEPER and will be on repeat in this house! And for any of you on Weight Watchers, this is an incredibly low point soup....as a matter of fact, with the rice it's only two points, but if you leave out the rice it's one point....without the toppings, of course. But the toppings are wonderful additions, and worth an extra few points! As always, my recipes are more a tutorial rather than a recipe, so feel free to adjust to suit your own tastes! Remember in my last post I had a crockpot going with my 'garbage broth' in it? This is what came out of all those scraps that would have been otherwise thrown away! 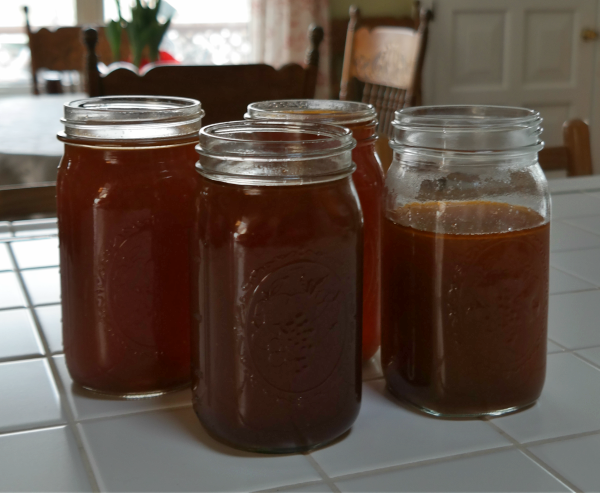 If you don't make your own broth (why not? It's so easy!) you will need two quarts of broth for this soup - you can use either veggie or chicken. I started by gathering most of my ingredients....I ended up adding a couple of things as time went on, which I shall share with you later. I got out my favorite big red pot, pre-heated it on low-medium with a drizzle of olive oil and chopped two medium onions. I just love that I can make something so delicious out of scraps, don't you? The pepper was next....I only used one because it was gigantic, but if you have smaller peppers you may want to use more than one. 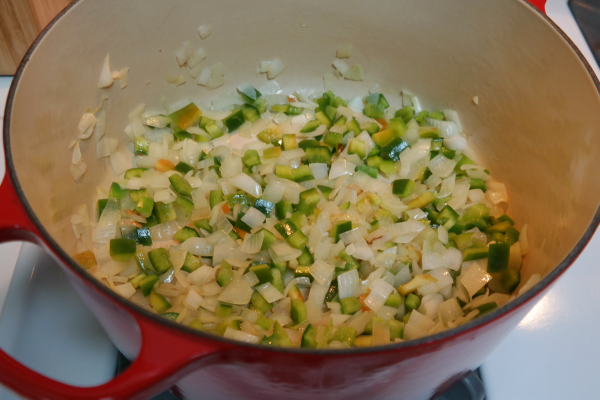 You'll notice I chopped the onion and pepper fairly small - I didn't want huge chunks of onion or pepper in the soup. I sauteed them for about 5 minutes until they started getting soft. 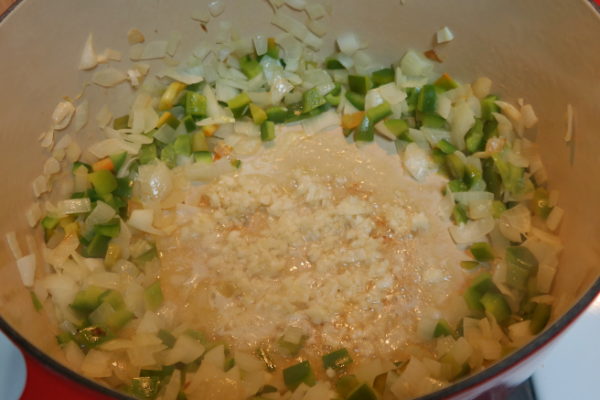 While the veggies were sauteing, I chopped up 4 large cloves of garlic. I made a hole in the center of the veggies, dropped in a pat of butter, and sauteed the garlic until golden brown. My favorite smell, without a doubt! When the garlic was done, in went two quarts of broth and I turned the heat up to high. 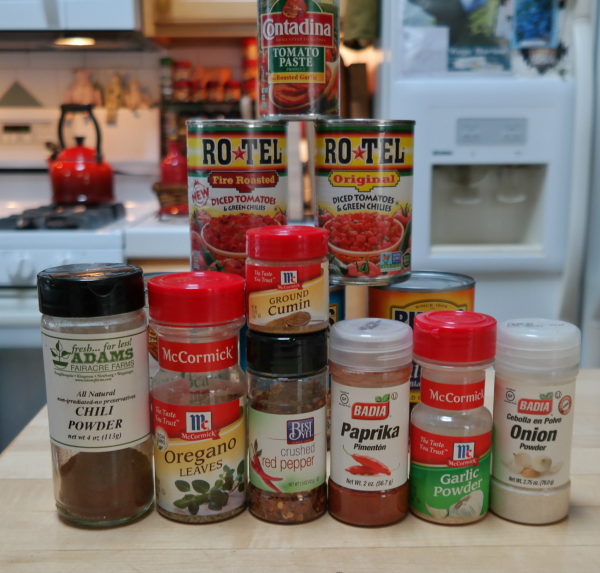 Both cans of Rotel were next, along with a can of tomato paste. I drained and rinsed both the kidney and pinto beans and tossed them in. 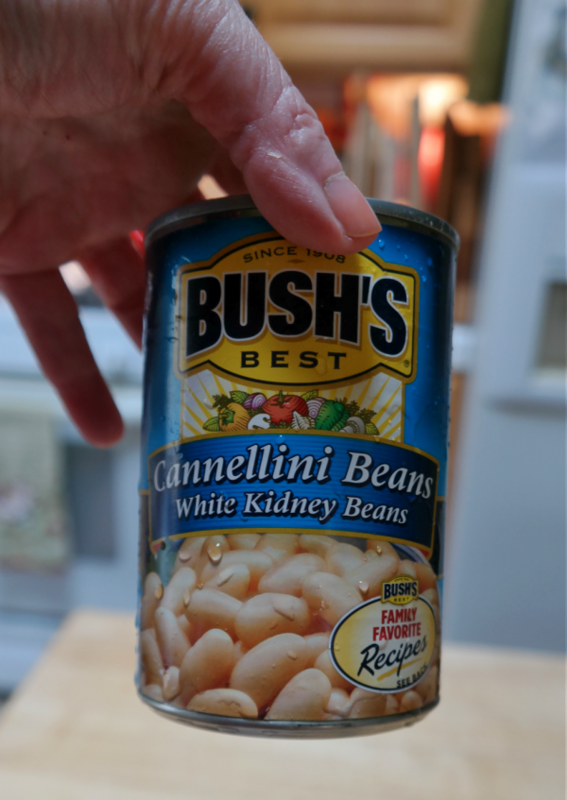 Feel free to use other beans if you have them, this recipe is easily adaptable. 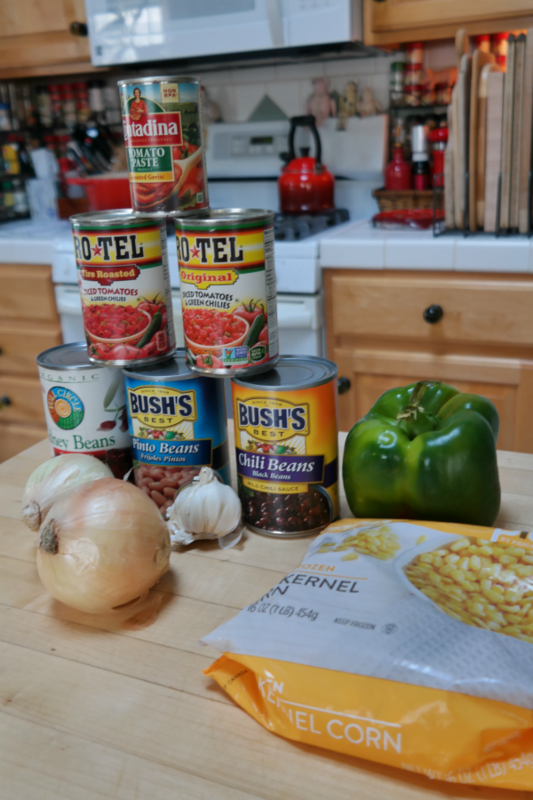 The chili beans were not rinsed as they have a mild chili sauce in them, and I wanted that flavor in the soup. I decided to toss in another can of beans, this time cannellini beans, also drained and rinsed. Next up was taco seasoning. I had a packet of lower sodium taco seasoning in the cupboard, but when I read the back of it I decided to make my own. I used 2 heaping tablespoons in the soup, which is about the equivalent of what would have been in the packet. Minus the MSG and other awful ingredients they put in there....why do they do that? 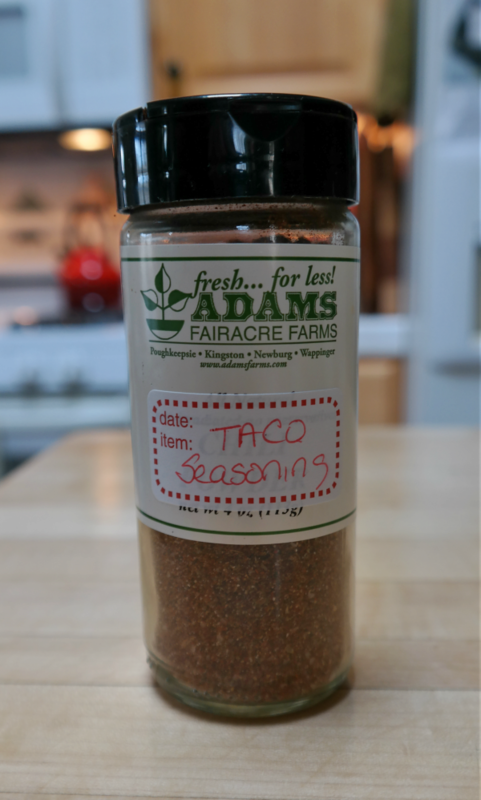 Now I have a nice little container of homemade taco seasoning, ready to use! While the soup was coming to a boil I cubed a half-pound of chicken cutlets that were still partially frozen. It's so much easier to cut up chicken when it's still partially frozen, without a doubt! 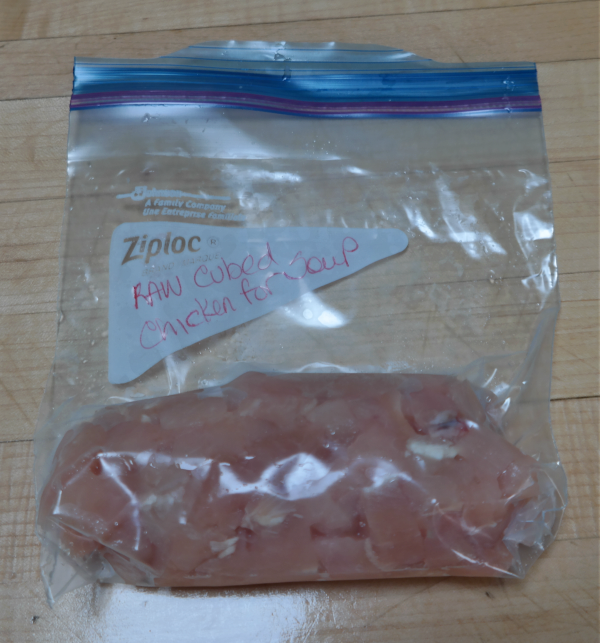 The other half-pound of cubed chicken went into the freezer for another soup, another day. I threw in the chicken, and lowered the heat to low and simmered the soup for about a half hour. 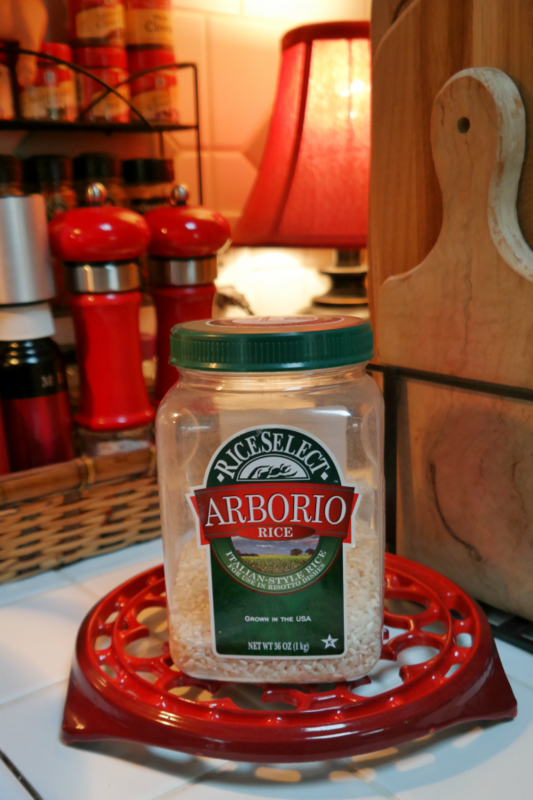 I decided at the last minute to add some rice - I used arborio rice but you can use whatever you have. I added about a cup of rice...but you can add more or less to your tastes. The lid went on, and I simmered the soup for another 20 minutes. Then I added in the bag of frozen corn, and simmered just a few more minutes until the corn was heated through. 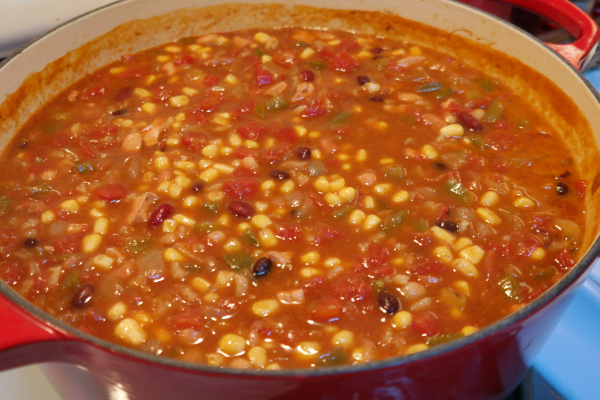 This is such an amazing, healthy, filling, delicious soup I can't even tell you! If you make it with veggie broth and no chicken it would be a great vegetarian meal. 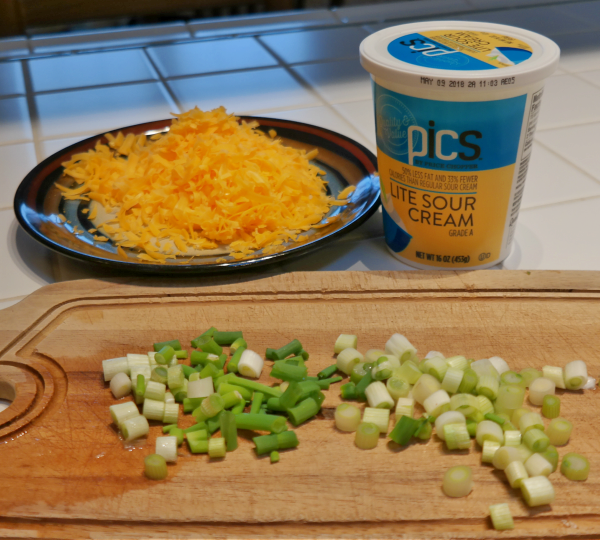 The last step in preparing this amazing soup was chopping some scallions and shredding some cheddar. I used Cracker Barrel's extra sharp reduced fat cheddar and light sour cream...and I didn't miss the extra fat and calories even the tiniest bit, believe me. 1 oz of cheddar plus 1 tsp of light sour cream adds 3 points to this recipe, making it a 5 pt dinner. I hope you'll give this soup a try! This made about 12 servings - 3 for that night's dinner, 3 lunches for the next day, and 6 servings in the freezer. That's my kind of meal! Easy peasy, economical, and low in points - the perfect recipe! Meanwhile, it looks like spring might finally make an appearance around here on Saturday so if you are looking for me, you'll find me in the garden starting the always huge task of spring cleanup. At least I know I have an easy meal waiting for me in the freezer if I'm too tired to cook! YUM! and I just started weight watchers - will be sure to add this soup to the menu 'round here. This is a great one to keep your points low, Karen Ann!! I always save most of my points for the evening, so had extra points and enjoyed a nice piece of sourdough bread with whipped butter along with this soup - yummmmm! This has been a long soup season, Marilyn, with the winter that never ends! I make Chicken Noodle often for my sweetie, he loves it. Thanks, Bernideen! It was super tasty and I have lots of leftovers in the freezer for some easy suppers in the future! This looks so good....and my family would love it. Of course, I think this is way beyond my skill level!! I need to show my husband. He's the adventurous chef! I think you could manage this one just fine, my friend!! I don't use all organic veggies either, Nancy - but I'm sure you wash things before you cut them, so I wouldn't worry too much about it. It's just scary what's in some of those packets, Susie, when you really look at them! I also make my own ranch mix, Italian dressing mix, brown gravy mix....basically most of the things that they sell in packets I try to make my own version so I know what's in it and I cut down the sodium as well. Sounds delish! I need to make my own taco seasoning. I always forget to pick up the ingredients! I'm lucky I already had all the ingredients in the house, Brenda. But yes, you should...especially since I know you like to make your taco soup a lot in the winter. Oh man! This looks sooo good! You always make great looking soups. I have always wanted to make a taco soup but never have. Well now's your chance, my friend! And I'm sure this would be a healthy meal for Nutri System as well as Weight Watchers! I used to make a very similar soup! Only I can't eat this anymore - can barely digest beans and a lot of fiery spices gives me heartburn. It's hell getting old, I tell ya! When I'm too lazy to make my own taco seasoning, I buy the one at Trader Joe's - it's the only one I can find that doesn't have MSG or any other nasty ingredients in it. YUMMY ... Soup is my absolute mainstay in life... This recipe looks fabulous... It’s such a plus that a Weight Watcher too.....Thanks for sharing ..Have a fabulous week-end. It's a fantastic soup and so filling as well as healthy - what a win/win! Thanks for stopping by, Zaa - nice to 'meet' you!! Isn't there just something so soul soothing about making soup? This looks delicious! Absolutely, Jen! I also love the fact that I prep and cook for one meal but end up with multiple meals out of it! My freezer is stuffed, it's time to start eating some more stuff out of there to make room for the bounty from this year's garden. This looks so delicious! Love watching you make soup...ha! I wish my daughter would take an interest, Donna! Some day when she moves out she's going to be calling me asking for my recipes....and I'll tell her to do a search on the blog, ha ha!! This sounds fantastic, Debbie! I LOVE making soups and stews It's like doing a jigsaw puzzle! I used to work as an assistant chef, and we saved all of the skins and peels, tops and bottoms, everything we used in our food prep, and then let it boil hours and hours the next day. Into quart jars it went, and it was used as a base for whatever soups we made that week. I guess it would be considered a veggie broth. That's one thing I will miss about this winter! I will squeeze this recipe in before it warms up--weatherwise-- too much! Sadly, we are expecting a cold and rainy weekend here. Loved your comment on watching makeup videos. A year ago I never knew they existed. In fact, last week I watched one on how to blow dry your hair, and I'm actually ticked off that this has been unknown to me for fifty some years!!! MY gosh--it's easy and my hair looks great! I hope you get moving on your great gardening skills, I skimmed back over your posts, another love we share! Now you've got me curious about that blow drying video - I'm going to have to search for that one, Jane! As for gardening, alas the weather is most definitely not in my favor this year....I am having such a hard time getting the gardens ready for spring and we are due more snow tomorrow - I could just cry at this point, I'm so over winter! My nails are an absolute mess, Vickie! I only got one day in the garden as the weather turned once more to winter and it's stuck there ever since. So sad, I'm really anxious to get my property cleaned up! This sounds great with all the different beans in it. Seems fairly easy too. Pinned!! I love the garbage broth idea! I don’t make this nearly often enough. In fact, I am long overdue for making some chicken stock. I have to go out tomorrow before the ball game, and I may just pick up a rotisserie chicken so I can make some nice chicken stock. I’m sure the soup is delicious. It looks delicious, of course, as most of your recipes do, but I also have a similar recipe myself and know how good it is. I got that garbage broth idea from you, Pattie, and a brilliant idea it was for sure! I have been saving my scraps ever since! 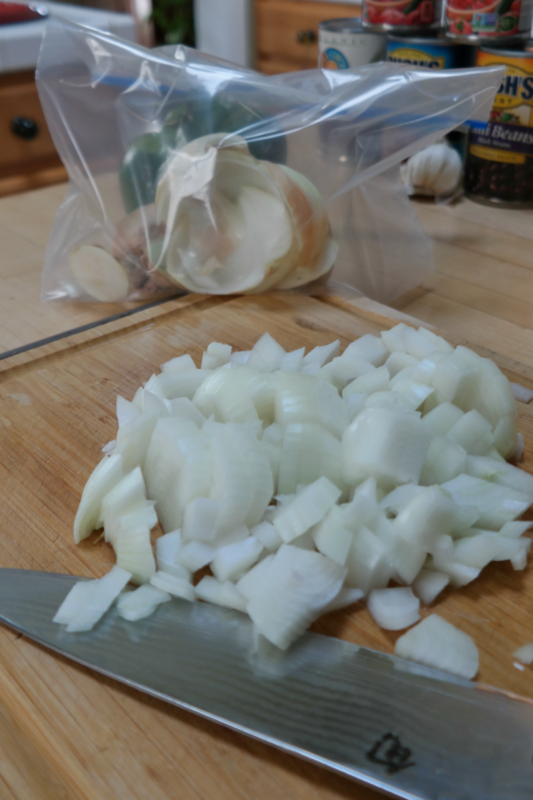 When I get a rotisserie chicken I save the carcass and skin in the freezer for broth days - I currently have about ten bags of chicken bits in the freezer ready for broth, but the scraps bag isn't quite full yet. Soon! Oh boy that looks delish and perfect for this crazy weather we are all having. Winter needs to leave and Spring needs to arrive. Happy Weekend. I'm with you on that one, Kris - Old Man Winter, get out of here already, we're sick of you! Hope we can find you out in the garden soon! You and me both, Doreen - I think you moved out of the Northeast just in time!!! That looks delicious! I do love a good taco soup! Well I hope you love this one too, Debbie!! Mountain Mama Is Going Solar! Weekend Projects Galore & The Bears Are Back!! This & That...And Where The Heck Is Spring?